The Angriest: Star Trek: Voyager: "Resolutions"
It is 13 May 1996, and time for another episode of Star Trek: Voyager. After being infected with an incurable virus that could infect the rest of the crew, Voyager first officer Chakotay (Robert Beltran) and Tuvix murderer Kathryn Janeway (Kate Mulgrew) are left behind on the planet as its natural properties will keep them alive. As the castaways build a new life for themselves, the Voyager crew struggle with their orders to continue heading for Earth. An attempt to achieve something quite different to the normal style of Voyager episode wobbles a little - not because the idea was a bad one, but because the episode simply doesn't go quite far enough. There are some good elements in "Resolutions", as well as a smart return of some old antagonists, but in the end everything falls just a little too flat and feels a little too dull. One positive aspect is what happens on Voyager in Janeway and Chakotay's absence. Tuvok (Tim Russ) assumes command, and follows Janeway's last commands to the letter: do not go looking for a cure, do not vacillate on leaving her and Chakotay behind, and under no circumstance approach the medically-gifted but antagonistic Vidiians for a cure. While Tuvok doggedly obeys Janeway's directives, his crew are not so convinced. Beginning with a resentful Harry Kim (Garrett Wang), a growing dissatisfaction leads to genuine unrest from deck to deck. When Tuvok re-appraises the situation and does contact the Vidiians it is through Dr Denora Pel, the Vidiian scientist who recently formed a doomed romantic relationship with the Doctor (Robert Picardo). It is a clever re-use of a pre-existing character, and a nice way to give the Vidiians a final appearance in Star Trek. After this, Voyager moves well beyond their territory. 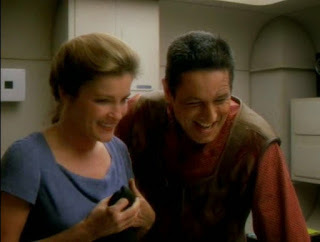 That is all the B-story to Janeway and Chakotay trying to make a life on an alien planet together. To the episode's credit it does not shoe-horn in a strange mystery to solve - save from a weirdly placed spider monkey - but focuses instead on their changing relationship. It almost works, but shies away from changing their relationship too much. Romance is strongly hinted at, but both character rebuff the possibility. Indeed it is hinted at so heavily that the episode cannot helped but disappoint when nothing eventuates. What there is, however, is a very nicely played definition of their relationship, and a showcase for Chakotay's fierce loyalty towards his captain. It's nice, but it feels like an opportunity was missed. Despite not quite working, "Resolutions" is well performed and includes some clever plot elements and character moments. It's the 15th good episode out of 25, giving Season 2 a quality ratio of 60 per cent with one more episode to go.